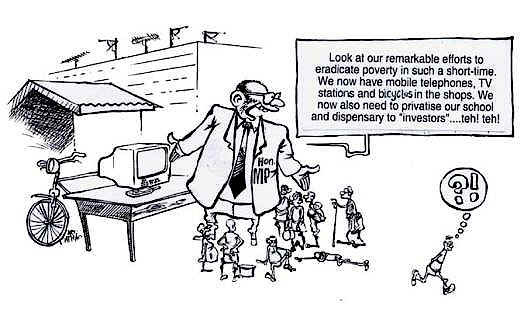 Participatory Poverty Assessments (PPAs) is one of the poverty monitoring tools that the Government has adopted to use in assessing the poverty situation in Tanzania. PPAs, is one of the important poverty monitoring instruments that has been earmarked for use throughout Tanzania. There is however a pressing need to create more awareness among different stakeholders on PPAs and how to use them to assess the poverty situation in Tanzania. PPAs have now been incorporated as one of the tools that will be used in the Poverty Monitoring System. Civil Society Organisations have an important role to play in conducting PPAs, because this is an area that CSOs have a comparative advantage. Therefore PPAs are an important tool for both the poverty monitoring system and Civil Society Organisations (CSOs). CSOs should therefore be aware and prepared to make effective use of them. PPAs have a number of comparative advantages over quantitative/statistical methods of poverty assessment and analysis. PPAs involve the poor themselves in assessing poverty trends and dynamics. PPAs are a way of assessing poverty in a way that gives the poor themselves an opportunity to describe and report the way they experience poverty. PPAs empower people. It allows for time to sit with people (sometime for up to one week) to understand what the people themselves think about poverty. PPAs use a multiplicity of data collection approaches and techniques. Different techniques such as village mapping, transcend walks, participatory wealth ranking and focus group interviews are used. The inclusion of PPA techniques in the Poverty Monitoring System enables PPAs to complement the quantitative data with qualitative data. As far as PPAs are concerned, qualitative data is the foundation. It provides in-depth understanding and information of the poverty situation as perceived by the communities affected by poverty and not outsiders. PPAs involve a number of actors and stakeholders from within the community as well as outsiders. Enable people concerned with the issue at hand to take action after appraising the situation and realising the development problem/challenge. Explore in-depth information in a holistic manner. Use a number of techniques for data collection, enabling the generation of both qualitative and quantitative data, therefore triangulating the information generated. Makes it possible to measure trends, which cannot be captured by pre-determined indicators. For example, the Household Budget survey can only say the percentage of people living below the poverty line, but they do not describe the context specific realities of poverty and the way it is experienced by the poor. Statistical surveys cannot go beyond the indicators. Have the function of informing policy and decision makers on the day-to-day realities/experiences of poor people in a powerful and accurate manner, thereby drawing their attention to policy gaps and impact. PPAs provide a great opportunity to CSOs. CSOs may use PPAs in the monitoring of the PRSP, in the process, CSOs may generate case studies, which may be used for advocacy purpose to influence policy. During the plenary discussions, a number of issues on PPA were raised. There is a strong drive within Government circles to ensure that the views of the poor, as perceived by the poor themselves are fed into the Poverty Monitoring System. This can mainly be done in the context of PPAs. Research and academic institutions that have so far conducted poverty research and analysis on behalf of the Government have no sufficient experience to deal with PPAs. In Zambia, for example, NGOs have been able to conduct PPAs annually, maintaining the same research sites. This enables to monitor both the depth and trend in poverty. The underlying principle of PPAs is to understand changes of poverty, or changes of perceptions of poverty overtime. If that information is going to be generated, then it is important to talk to the poor people themselves. How the poor perceive themselves. Most NGOs are district based. Access to the internet is remote. What chances do we have to participate in the proposed PPA consortium? There is a need for CSOs to have increased knowledge and awareness on PRSP. There is an urgent need to promote PPA knowledge and skills among CSOs for effective monitoring of PRSP goals and actions.